Trojan Slayer is a software program that helps to protect your computer from Trojan infections. Trojans are small programs that infect your computer and cause it to do things you do not want it to do. They are similar in nature and function to computer viruses, although there are some technical differences. They are one of the more danerous forms of spyware. Some Trojans send information stored on your computer, such as credit card information or your passwords, to the person who write the Trojan. This allows the person to charge things to your credit card, use your email or Internet account, or even steal your identity. (There have even been some reports that organized crime has gotten into the Trojan writing business.) Other Trojans hijack your Web browser, redirect it to sites you do not want to go to. Some Trojans use your computer to send out junk email (Spam). Some Trojans are simply malicious, hiding for a while and then erasing your hard drive contents. In short, having a Trojan infect your computer is not a good thing. There are a variety of programs available to eliminate Trojans from your computer. Most of these work by scanning your computer, looking for known Trojans that are listed in a data file that comes with the program. The problem with this is that new Trojans are constantly being developed that can infect your computer. It takes time for the software company to study the new Trojan and add the description to its data file. Also, you your computer only checks periodically to see if a new file is available. During the time the new file is being prepared, your computer is vulnerable. Often, weeks or even more time passes between the time a Trojan infects your computer and the time it is discovered, analyzed, put into a file, and the file is sent to your computer. A Trojan can do considerable damage to you in that time. In addition, these Trojan scanner programs often take a long time to scan for specific Trojans. As a result, you normally use them periodically to check for Trojans (such as performing a weekly scan), rather than continuously. 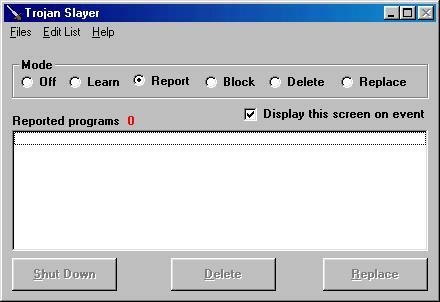 1) Report- In this mode, Trojan Slayer will pop up a screen informing you of any unknown programs that are running. You can ignore the new program, have Trojan Slayer learn it as a good program, shut down the new program (cause it to stop running), delete the file from your hard drive, or replace it with a dummy file that blocks further infection. 2) Block- In this mode, Trojan Slayer will automatically shut down any unidentified program it finds running. You have the option of having Trojan Slayer pop up a screen informing you of any programs it has blocked, or discreetly flash an icon on the system tray when it blocks a program, allowing you to view the report at your convenience. 3) Delete - In this mode, Trojan Slayer will not only shut down any unidentified programs it finds running, it will automatically delete the file from your hard drive. This option should obviously only be used once you are sure you have allowed Trojan Slayer to learn any program you might ever want to use. It is a bit drastic, but it is useful if you have a serious problem with Trojans and security is very important. 4) Replace - In this mode, Trojan Slayer will not only shut down any unidentified programs it finds running, it will automatically delete the file from your hard drive and replace the file with a dummy file of the same name. This is sometimes necessary because some Trojan files actually replace themselves if they are deleted. Replacing the file with a dummy file of the same name can block this replacement technique. Trojan Slayer is extremely flexible and easy to use. If you find that there was a Trojan running on your computer while Trojan Slayer was in Learn mode and Trojan Slayer learned it as a good program, you can manually delete the Trojan from the list of "good" program. If you want to add new software or use a programs that you had not run while Trojan Slayer was in learn mode, you can always switch back to Learn mode just long enough for Trojan Slayer to learn the good program, and then switch back to an enforcement mode. Trojan Slayer is best used in conjunction with other Trojan and spyware or virus fighting software. That is, we recommend that you use both Trojan Slayer and whatever other virus fighting software you like. They are not mutually exclusive, and Trojan Slayer will not interfere with any other know anti-virus software. Most computer security consultants recommend having several layers of virus and Trojan protection. Trojan Slayer is available as shareware. Try it for a month to see if you like it before you have to pay for it. If you do like it, pay a one-time $25 registration fee (volume discounts available), unlike many other anti-Trojan programs that require annual renewal fees. Just download the install file to your computer, then run the file like a program by double-clicking on the install file in Windows Explorer or My Computer to install Trojan Slayer. Remember that complete instructions are provided for uninstalling Trojan Slayer if you decide that you do not like it. Trojan Slayer runs on Windows 95/98/2000/XP/ME/NT (some minor functions may not work on NT). Click here to download the installation program (tsarc.exe). Just download the file, then run it by double clicking on the file in My Computer or Windows Explorer. If you like this program, but would like to see some improvements or additional features, contact Leithauser Research at Leithauser@aol.com or (386)-410-6769 and describe the addition features you would like to see in this program. If they sound like good ideas, we will add the improvements at no charge.